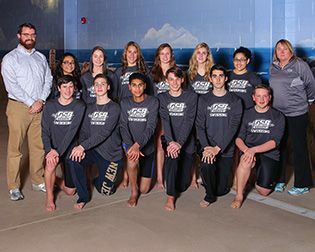 This winter was a building season for the varsity swim team. The squad of 17 went 1-3 in regular season meets and competed in the Somerset County Tournament and the NJISAA Championships in February. Highlights of the season included a win over Jonathan Dayton High (88-78), with the team taking first place in seven events. The team's seniors posted strong showings at that meet, with Jennifer Montejo taking first in both the 200 IM and the 100 Butterfly, Carter Silvey taking first in the 50 Freestyle and second in the 100 Freestyle, and Michael Urowsky helping the 200 Medley relay team to a first place finish (along with Montejo, Silvey and Gabrielle Breuer '17). Also graduating this spring are seniors Sophie Connell and Elisabeth Middleton, whose contributions will be missed. Among the team's juniors, Breuer, Mikaela Gegelys and Emily Supron will be expected to take the lead, and the program will look to continued contributions from Carolyn Brand and Cindy He. Sophomores Giselle Garcia and Sabrina Sukhin both posted strong seasons and will be expected to make important contributions next year. Boding well for the future of the program, this year's team boasted a talented freshen lineup of Jason Berg, Christian Ernst, Jake Panza, Preston Reep and Christopher Varghese. Stay tuned for more end-of-season wraps from our varsity, JV and Middle School teams. Go Knights!